Today was fun. 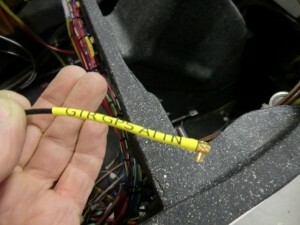 I wanted to shorten the GTR antenna to remove a bunch of extra wire which wasnt needed. 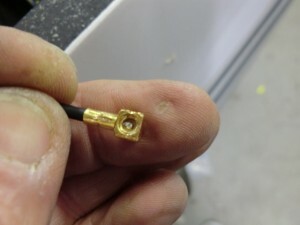 To put on the new connector, I had to solder a very tiny post on a very tiny connector inside a hole… Fortunately I had some dental tools to clean up the inside of the connector from the excess solder. Done. 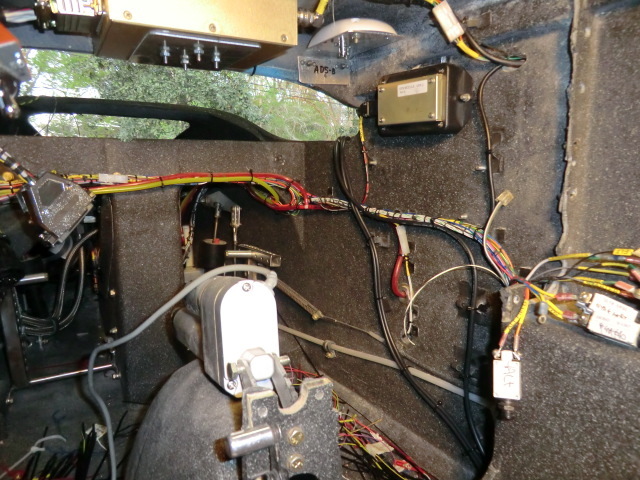 On to more antenna connections and finish up the wiring. Today was spent wiring up the back part of the radio stack. Sure is nice to tidy things up a bit. After finishing up the hull wiring yesterday, I completed the connection of the remaining radio power and grounds today. I only found a few errors on the install which were quickly fixed. 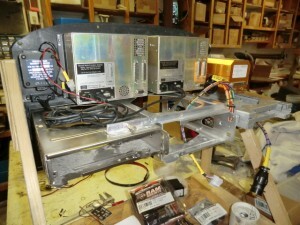 The electrical power system is nicely cleaned up now. 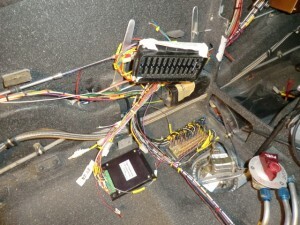 As hoped for all the wiring is hidden for a nice clean look. 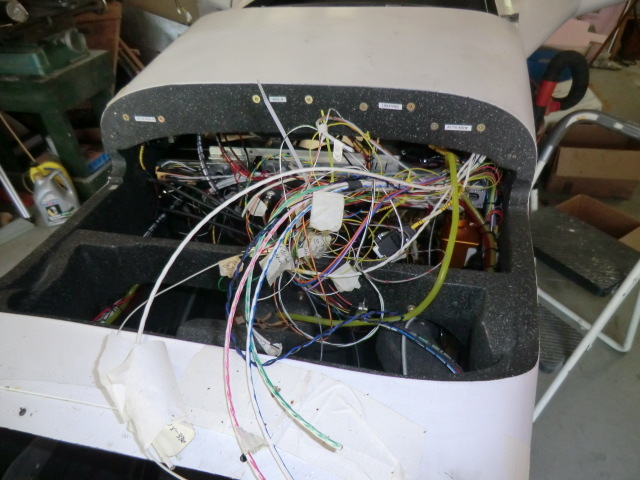 Tomorrow, it will be the last of the major wiring…. hooking up all the radio data lines to the hull wiring. When finished I can start the electrical tests in preparation for full system turn on, computer setup and programing of the data communications systems. Cant wait! 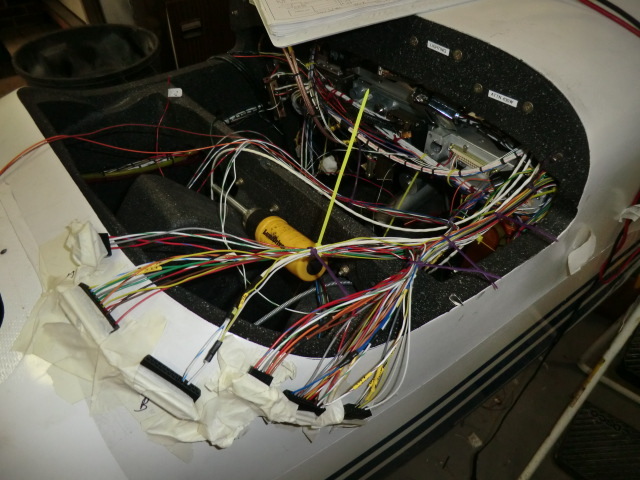 Finally the fuselage wiring is done! Today the rats nest of wires in the magically disappeared into an organize mess (lots) of wires. It is truly amazing to me the number of wires and it is my great hope that all work as planned (or at least be easy to trouble shoot. I have removed the temporay tie wraps, installing the permanent ones to get ready for the big day tomorrow. 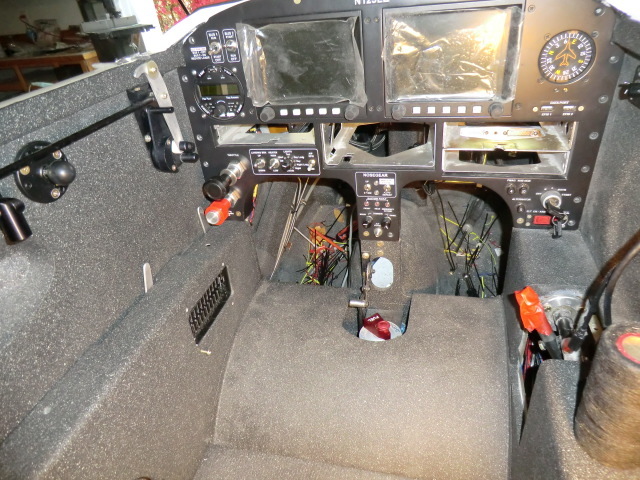 I’ll be installing the instrument panel for the FINAL time. It is finally time to “marry” the panel to the plane. I think I should have a big ceremony and eat a cup cake with a candle on it. 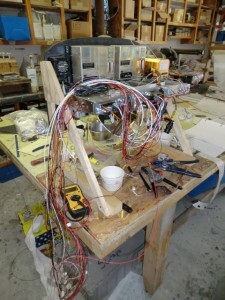 Shortly power will be applied to the bird and she will start to come to life! Cant wait. Currently, I am have about 60 pages of wiring diagrams. Boy, talk about time consuming! 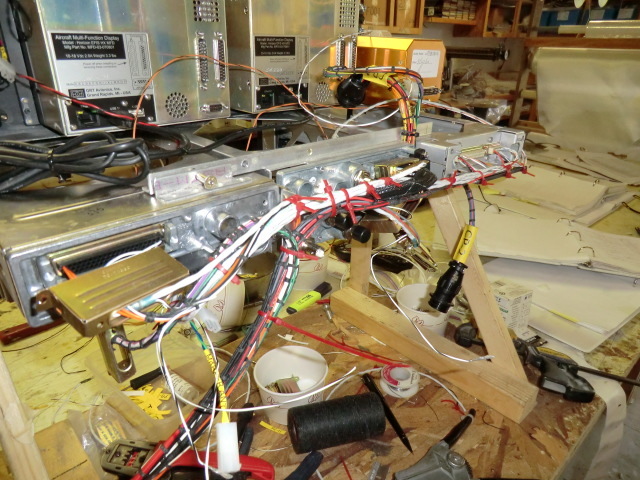 Each one has to be reviewed, installed, corrected, rechecked numerous times. On the flip side, I can already see the need for the documentation as I forget what I have done from day to day. Just too many wires. It is easy to image me or anyone trying to fix the wiring 5 years from now thinking how great it is to have detailed records of the installation. 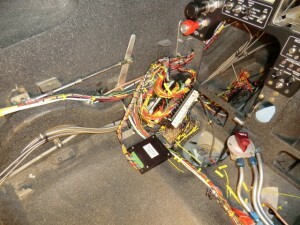 I have also drawn wiring harnesses into the paperwork to record where the wires go. This is a pdf of Pg 56 if you wish to check out. 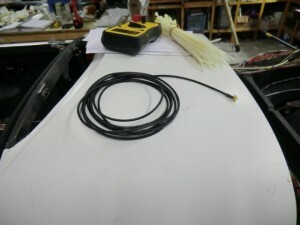 It is the harness for the Noselift system. 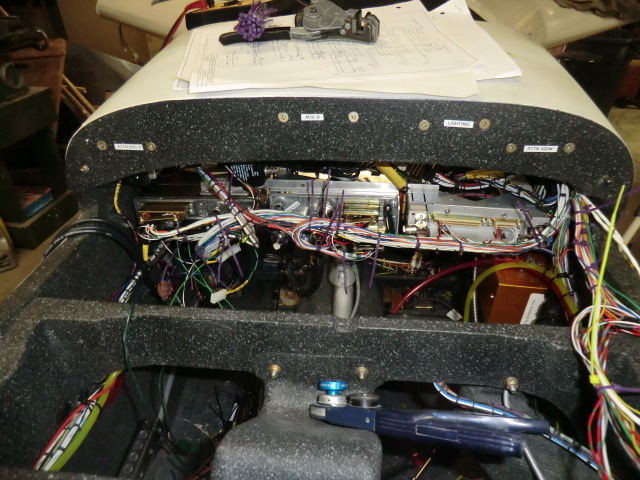 Today the wiring on the instrument panel was finished out. Prior to the final install in the plane, I needed to do as much wiring as possible on the bench. 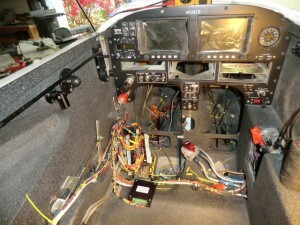 All the harness were hooked up and installed and the point to point wiring on the panel was completed. 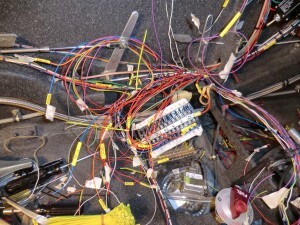 What a mess of wires. The majority of them are just power and grounds. 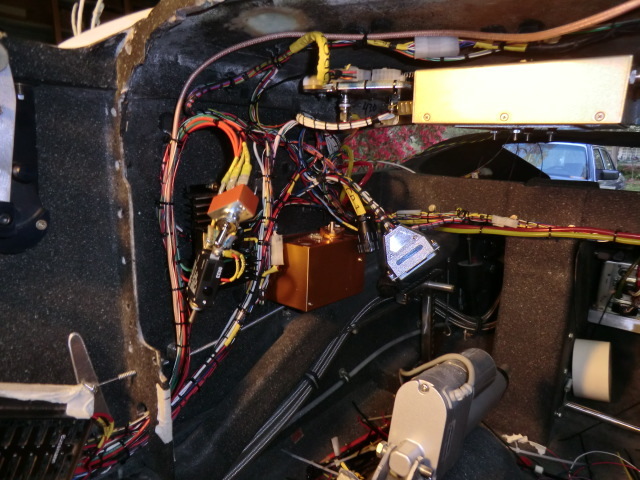 I decided to route them on the stbd side of the plane as the port side has a huge number of wires and I didnt want to add to the the complexity. Nicely bound together. Tomorrow I will do the FINAL installation of the panel in the plane and “marry” the wiring together. Once done, this harness will become part of the plane harness.